We here at Reach And Teach got a real kick out of it when a few days after President Obama's election we got an order from the DOJ for this poster! They also ordered "Words Are Not for Hurting" (a board book about using your words for kindness). We could tell that a new dawn was rising in America. Are immigrants a drain on our resources? No. Do most people oppose immigration? No. Do immigrants take American jobs from Americans? No. Buy the poster for the rest of the story. Rightists never tire of their disgusting exploitation of immigrants. These resources will help you address this baseless fear mongering. 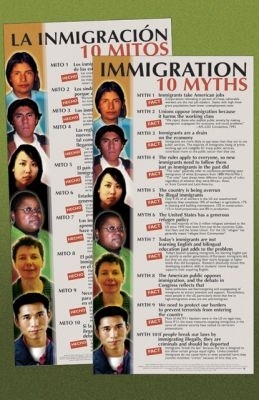 Immigration: 10 Myths poster is taken from the myths and debates outlined in Aviva Chomsky's book: They Take Our Jobs And 20 Other Myths About Immigration. The Reach And Teach team has been deeply involved in immigration issues for many years now. One of the most heart-breaking stories we documented is sadly all too common. Click here to read about the Ramirez family. We've also worked with local elected officials and through Multifaith Voices for Peace and Justice to document how Immigration and Customs Enforcement treats detainees. Click here to read about that.